While USD has been supported by the general high volatility and risky markets over the last month, EUR has been under pressure due to Italy’s budget. 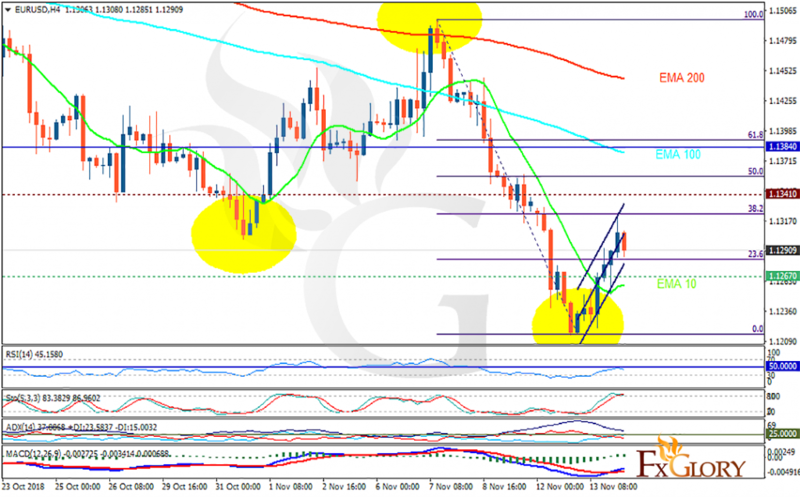 The support rests at 1.12670 with resistance at 1.13410 which both lines are below the weekly pivot point at 1.13840. The EMA of 10 is moving with bullish bias in the ascendant channel but it is below the EMA of 200 and the EMA of 100. The RSI is moving below the 50 level, the Stochastic is moving in high ranges and the MACD line is above the signal line in the positive territory. The ADX is showing weak buy signal. While bears are still in control of the chart, there is a high probability that EURUSD continues its downward trend towards 1.12; considering the technical analysis, the pair may have started its correction pattern and now it is targeting 61.8 level of Fibonacci at 1.14.